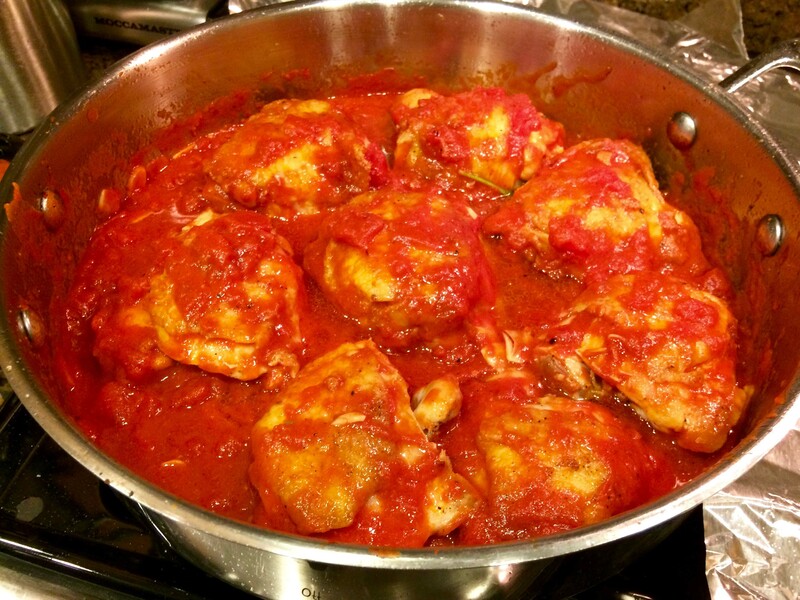 Say “chicken cacciatore” to most people and, more than likely, it will conjure up an image of sautéed chicken pieces simmered in tomato sauce along with vegetables like peppers, onions, mushrooms, etc. Until the other day I was among those people. 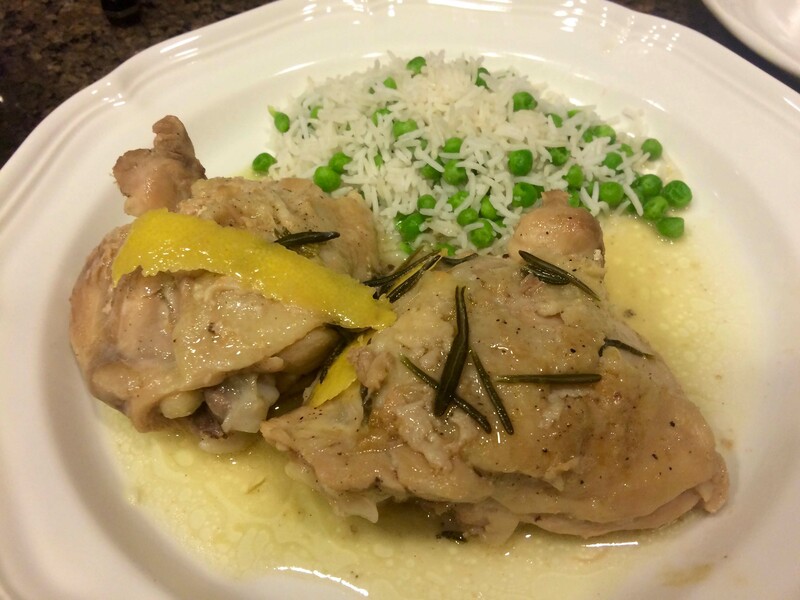 In fact, I’ve posted several recipes for the dish on this blog. 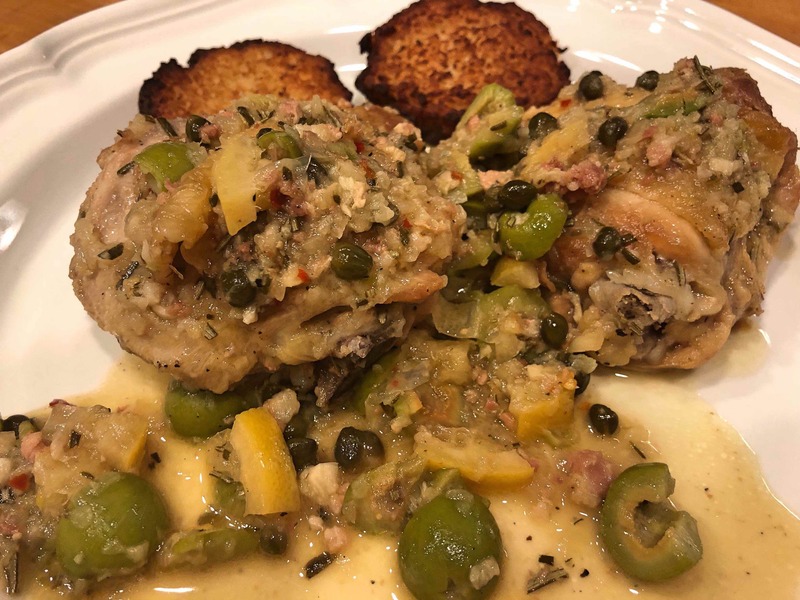 Yesterday, however, I came across a recipe in Italian Country Cooking by Loukie Werle for an Umbrian-style version of the dish that has neither tomatoes nor peppers but in their place uses olives, capers, and pea-sized cubes of lemon. Its sauce starts with a savory and aromatic soffritto of minced pancetta, onion, rosemary, and garlic and then finishes with white wine, vinegar, capers, lemon and chili flakes. 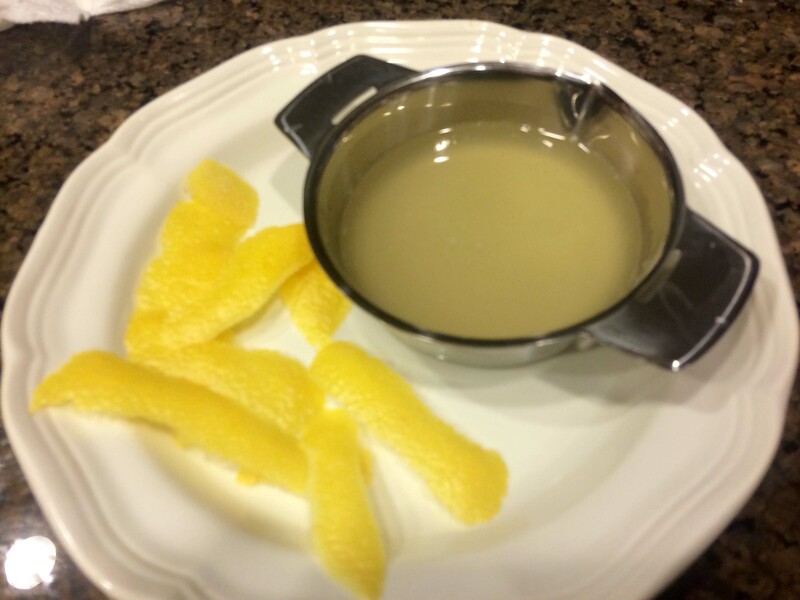 I love it when friends and family pass along recipes that they’ve read about and think of me. Sometimes, however, they may over estimate my culinary capabilities and propose dishes that are far beyond my skills and sometimes even my budget. 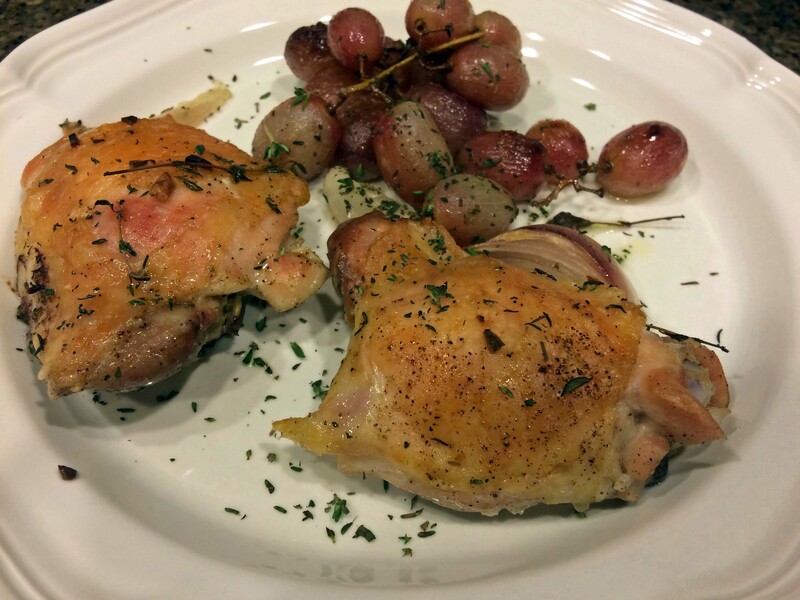 But recently a close friend from back home sent me a link to a New York Times recipe for sheet-pan chicken thighs with shallots and grapes. 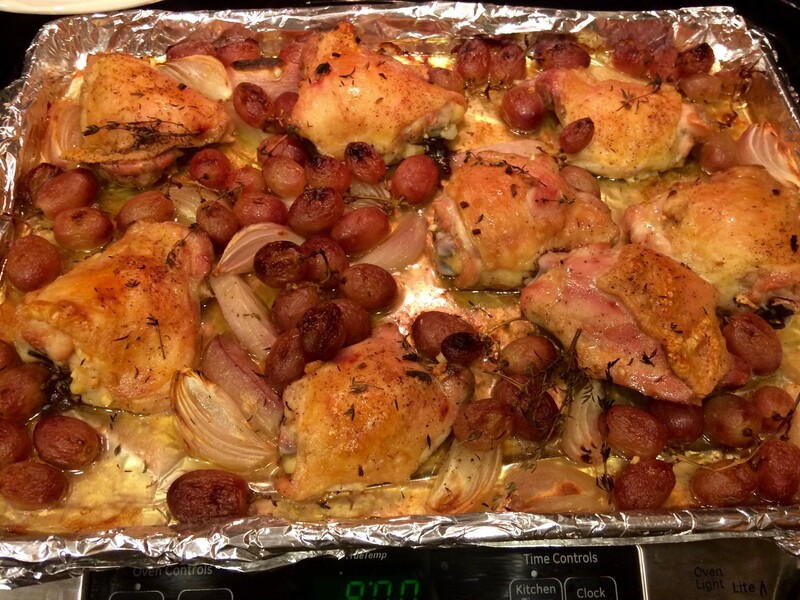 When I first saw the recipe’s photo, I thought I had already made it, but soon realized that I had only made a similar sheet-pan supper but with sausages. This is an easy recipe and perfect for a mid-week dinner. 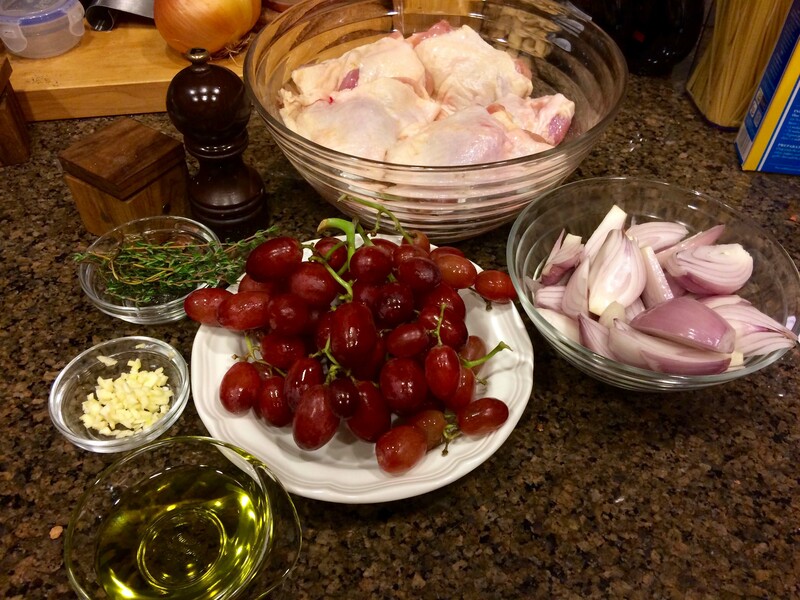 The flavors of the shallots and grapes blend beautifully and provide the perfect complement to the crispy chicken. Unfortunately, I was unable to find the za’atar, a Middle Eastern spice mix, which I think would have added more complexity to the dish. I also found the recipe’s cooking time a tad too short to render the chicken as brown and crispy as I like it. I cooked mine for about 40 to 45 minutes, followed by two to three additional minutes under the broiler. Finally, don’t forget the recommended flaked salt for serving. It adds a lot to the final dish. Heat the oven to 425 degrees. 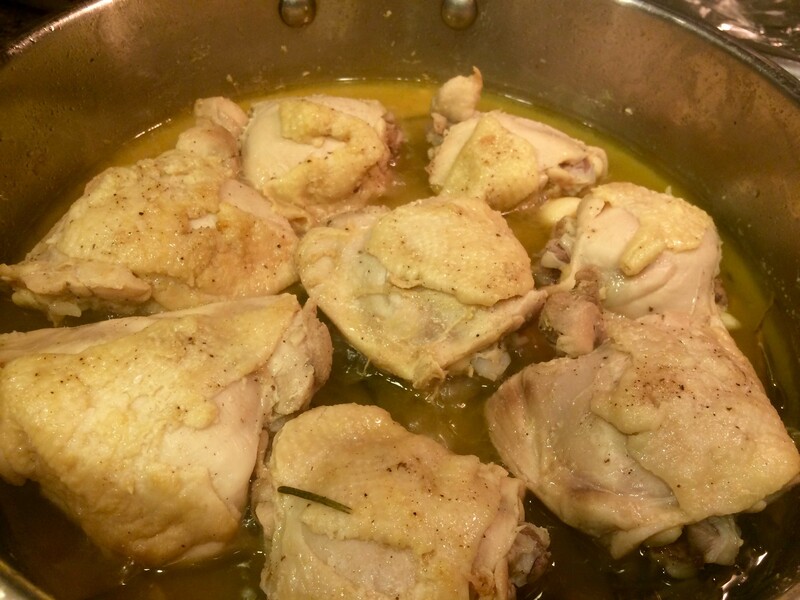 In a large bowl, toss together the chicken with 1 tablespoon olive oil, garlic and za’atar, if using. Season well with salt and pepper. 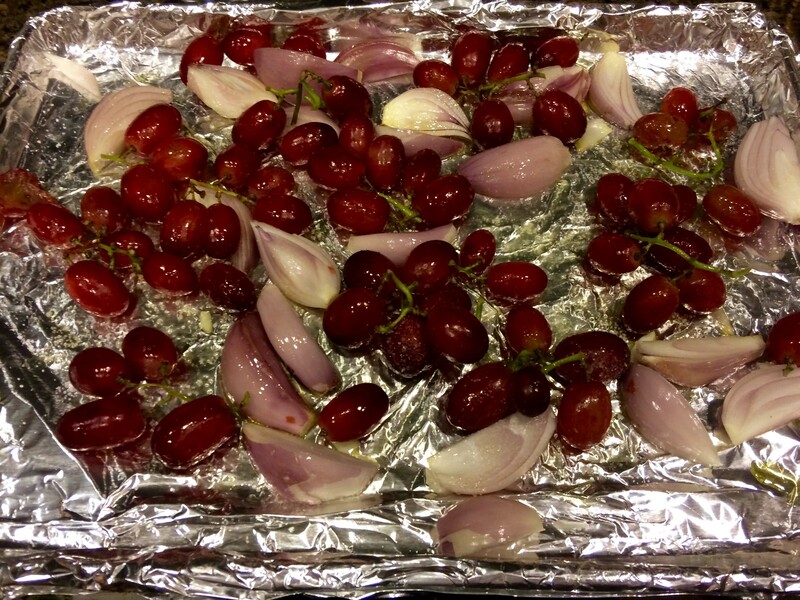 Place the shallots and the grapes on the sheet pan and gently toss with the remaining olive oil and season well with salt. 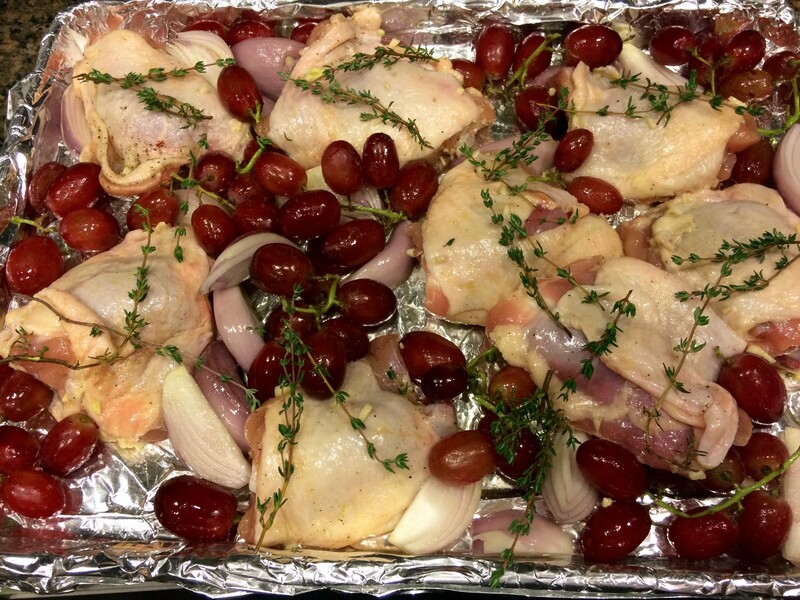 Nestle the chicken skin side up in between the shallots and grapes and lay the thyme sprigs on top of the mixture. Roast for 25 to 30 minutes until the chicken is cooked through and the shallots and grapes begin to soften and caramelize around the edges of the pan. Turn the oven to broil and move the oven rack to sit right below it. Remove and discard the thyme sprigs and broil the chicken for 1 to 2 minutes until the skin of the chicken is crispy and golden. Scatter with chopped thyme and season with flaky salt. My family was pretty traditional when it came to Italian cooking. Both my mother and my aunt prepared recipes passed down to them by their mothers and took pride in preserving their traditions. Perhaps because of this adherence to the past, I never had had the ever popular Italian-American Chicken Parm until I was in high school. I remember my first time with it. My friends raved about the dish so much that I simply had to try it. 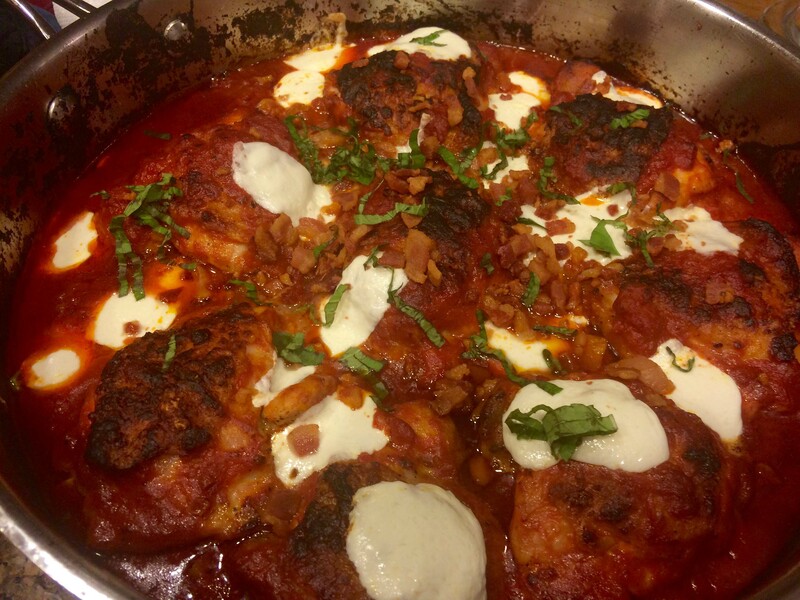 I thought it would be similar to the only other “parm” I knew, namely my aunt’s eggplant parmigiana, with perfectly fried slices of eggplant baked in layers with a light tomato sauce, fresh mozzarella, and Parmigiano Reggiano. However, when my order of chicken parm appeared, my disappointment with the dish hit me before I even tasted it. The sight and smell of an overly fried and similarly over breaded skinless chicken cutlet drowning in a thick, sweetened tomato sauce and topped with a rubbery piece of “mozz” were, to put it mildly, less than appealing. The taste was not much better. Nevertheless, to fit in with the crowd, I ate most of it and said “Wow, the best chicken parm I ever had.” It was also my last. Back to the present. 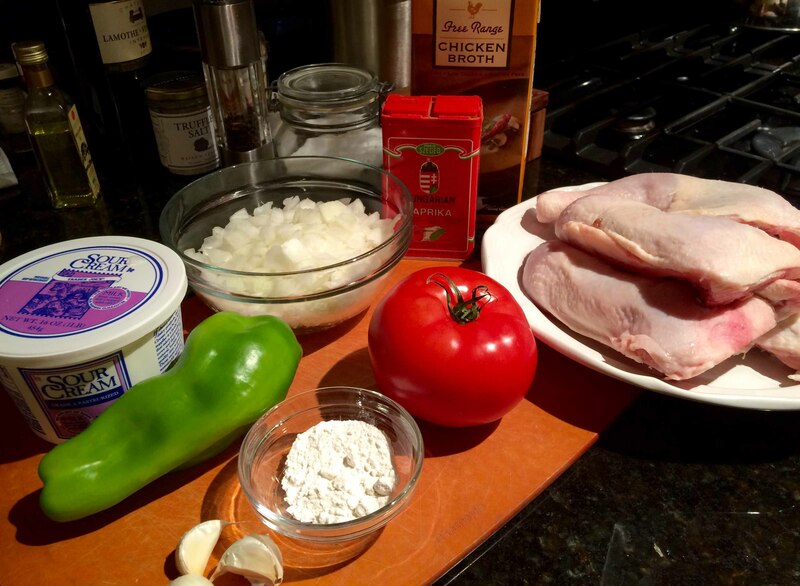 Intrigued by a tempting picture of what was called “Chicken Pizza” in a NY Times “What to Cook Now” newsletter, I clicked my way to the recipe by Melissa Clark. My intrigue lessened, however, when I read in her introduction that the dish was “reminiscent of Chicken Parmesan.” Yuck! But that picture was so still tempting. 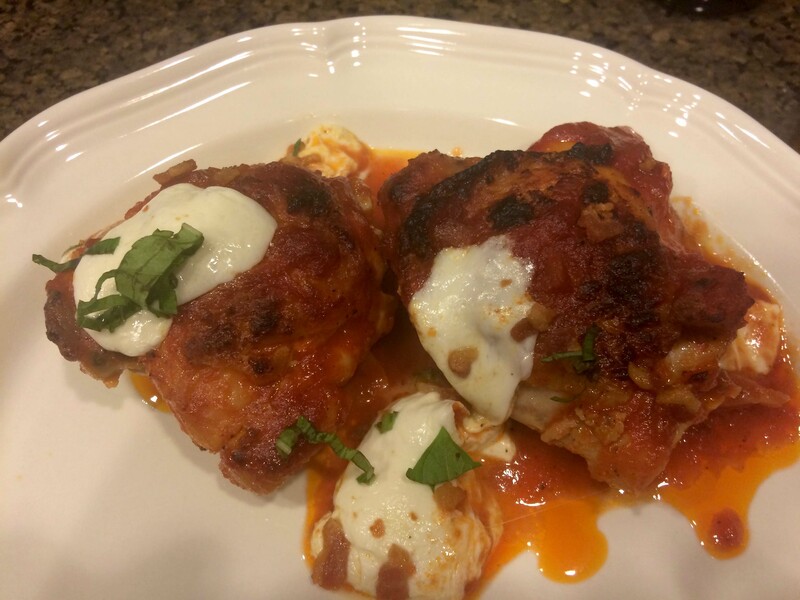 Well last night, I finally made the dish and am happy to report it was a huge success, or as my better half proclaimed “a keeper!” The sauce had layers of flavor from the anchovies and pancetta; the bocconcini, perfectly melted, complemented the sauce; and the chicken thighs were moist and juicy. A far cry from that first chicken parm. 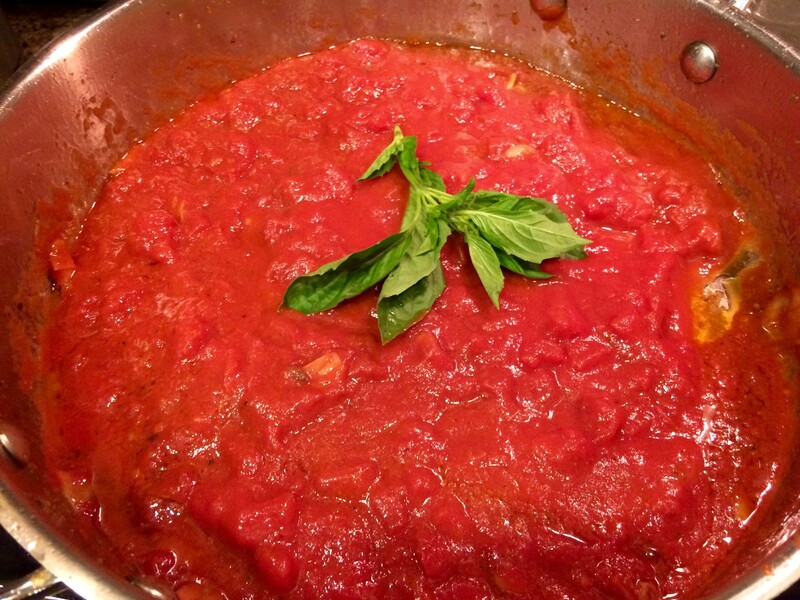 I followed the recipe pretty closely, only adding one extra anchovy, upping the amount of olive oil to 2 tablespoons, and using chopped rather than whole imported Italian tomatoes. I also chose to deglaze the pan with a little white wine after browning the chicken and frying the garlic, anchovies, and red pepper flakes. 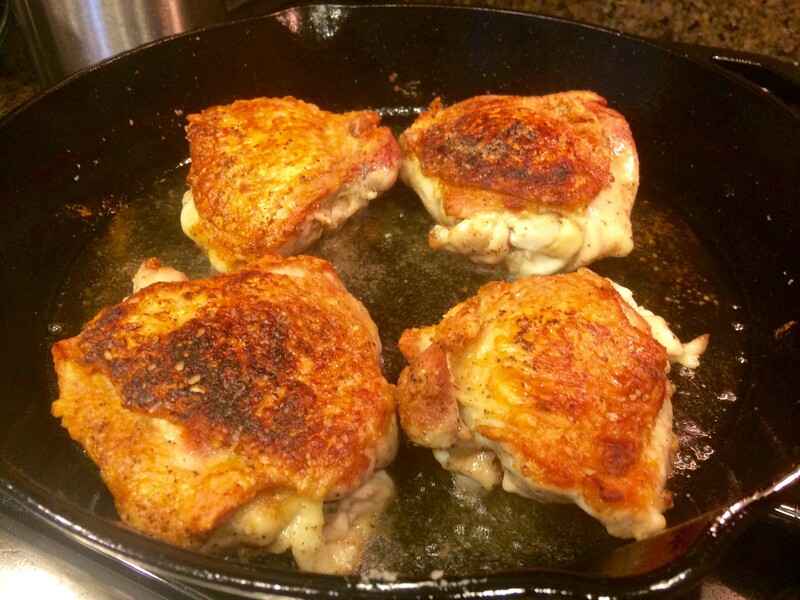 In a large oven-proof skillet, warm oil over medium-high heat. 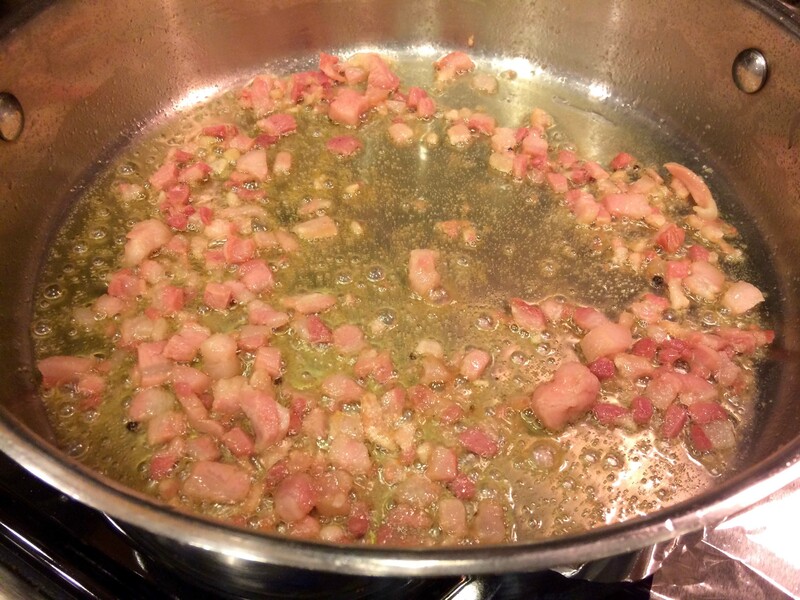 Add pancetta and cook, stirring frequently, until browned. 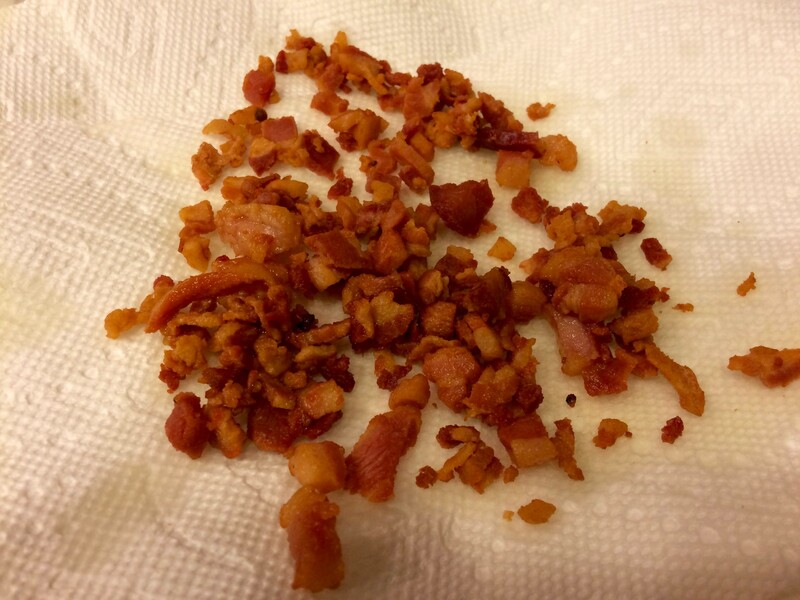 Use a slotted spoon to transfer pancetta to a paper-towel-lined plate. 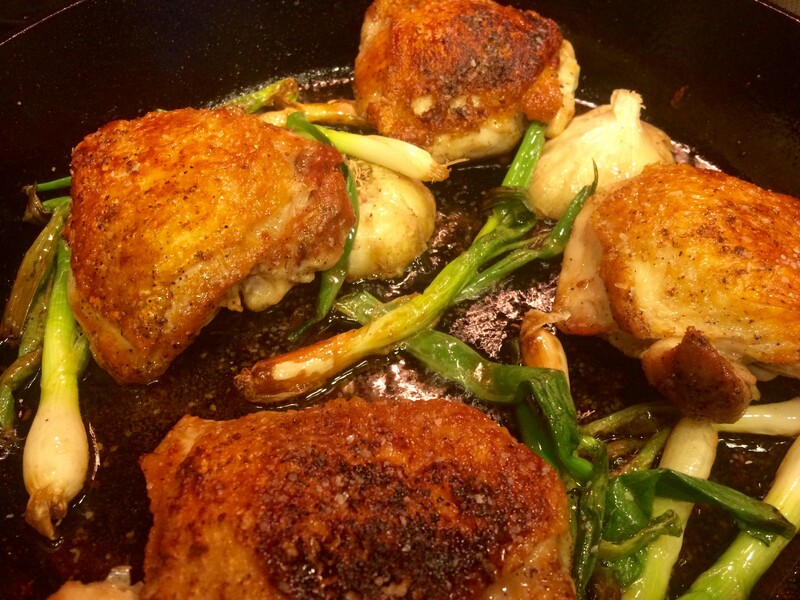 Add chicken to skillet. Sear, turning only occasionally, until well browned on all sides, about 10 minutes. (My chicken took almost 20 minutes to brown.) Transfer to a large plate. 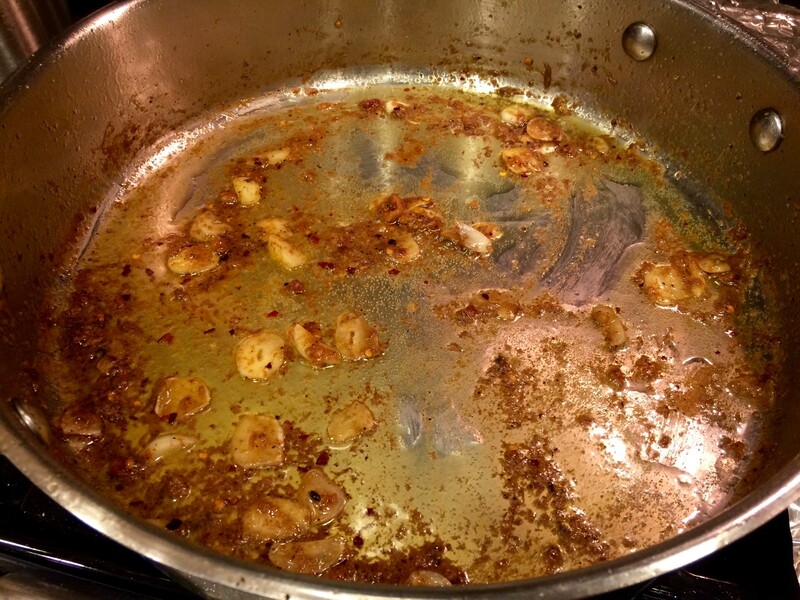 Pour off all but 1 tablespoon oil. 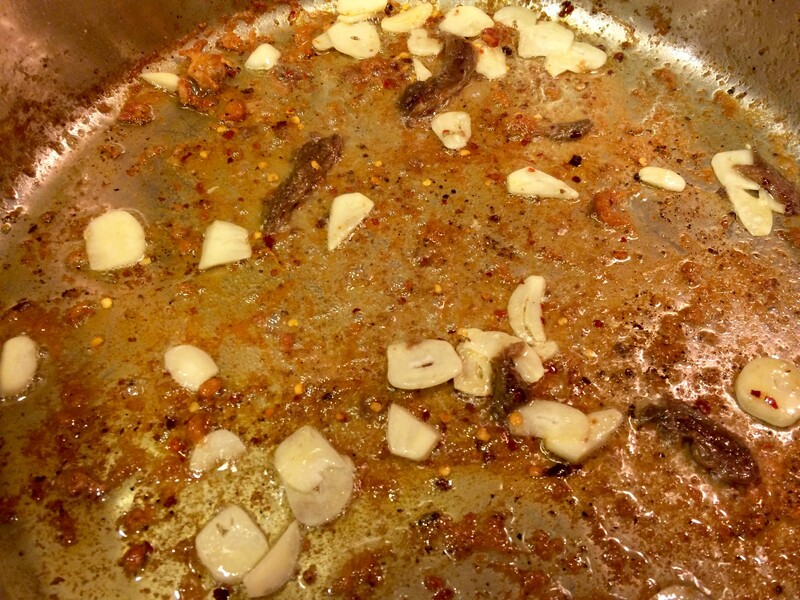 Add garlic, anchovy and red pepper flakes to skillet; fry 1 minute. I chose here to deglaze the pan with wine. Transfer skillet to oven and cook, uncovered, until chicken is no longer pink, about 30 minutes. 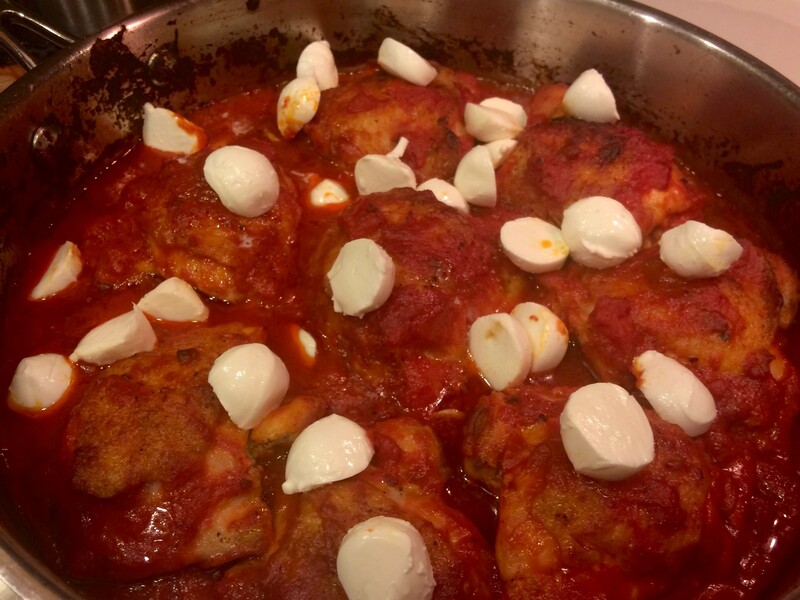 Scatter bocconcini or mozzarella pieces over skillet. 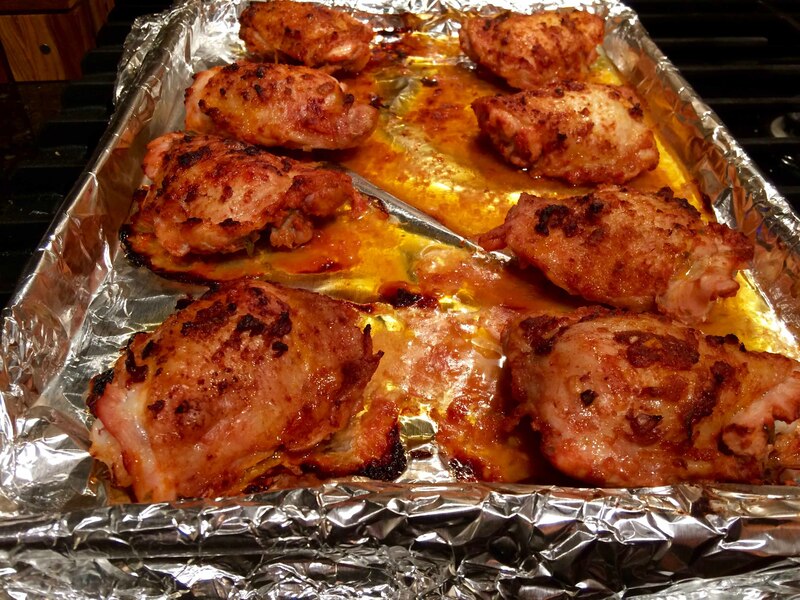 Adjust oven temperature to broil. Return skillet to oven and broil until cheese is melted and bubbling, 2 to 3 minutes (watch carefully to see that it does not burn). Garnish with pancetta and chopped basil before serving. 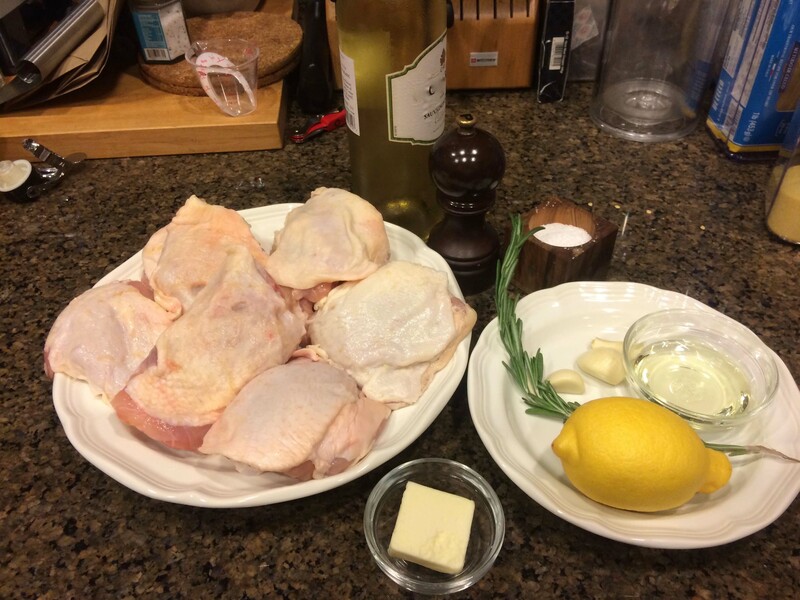 Our markets in downtown San Diego frequently seem to have extraordinary sales on chicken; for example, today I found bone-in skin-on chicken thighs for 77 cents a pound. 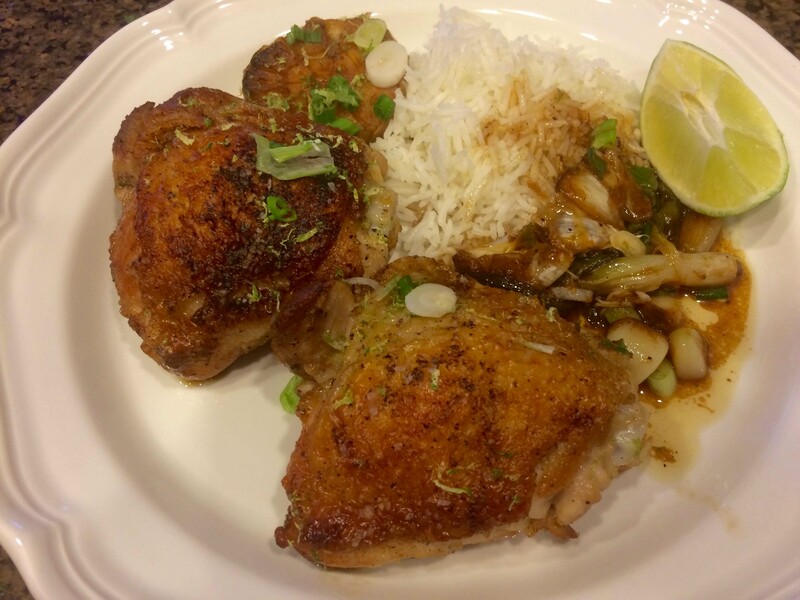 Consequently, my plans for a pasta dinner were put on hold and replaced with a dish that caught my eye on the New York Times “Cooking” site: Garlicky Chicken Thighs with Scallion and Lime. It’s a relatively simple dish to prepare and requires a minimum of ingredients. My only substitution was 2 tablespoons of olive oil for the 1 tablespoon of canola oil. And while the recipe gave the choice of using “a large Dutch oven or a high-sided skillet” for cooking the dish, I opted for my trusty 12″ cast-iron skillet. Sure, it made a mess of my stove, but I think the skillet was a better choice as it allowed for a better reduction of the sauce. I was also tempted to substitute white wine for the water, but went with the latter to let the flavors of the garlic and scallions to stand on their own. And although the recipe calls for discarding the halved garlic head at the end, I served it with the chicken because it was packed with sweet roasted flavor. Finally, to absorb the sauce, I served steamed Basmati rice. 1. 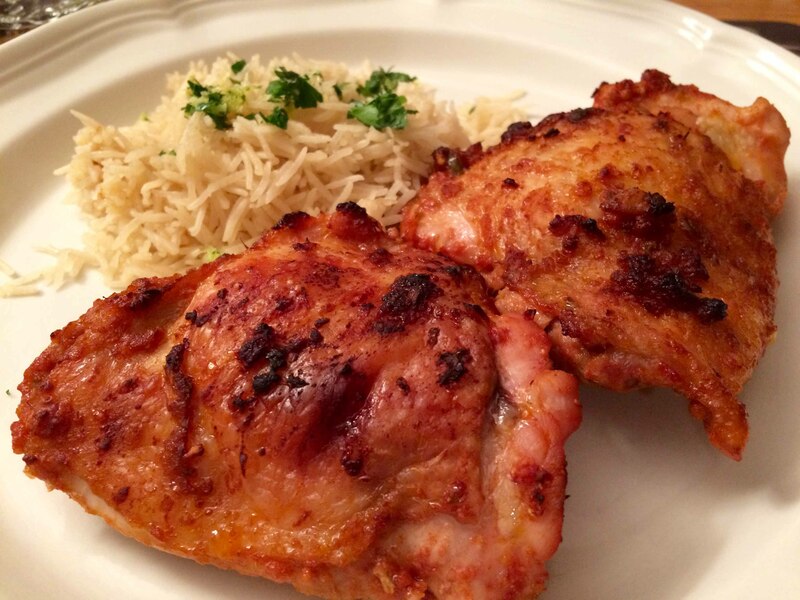 – Season chicken with salt and pepper on both sides. 3. 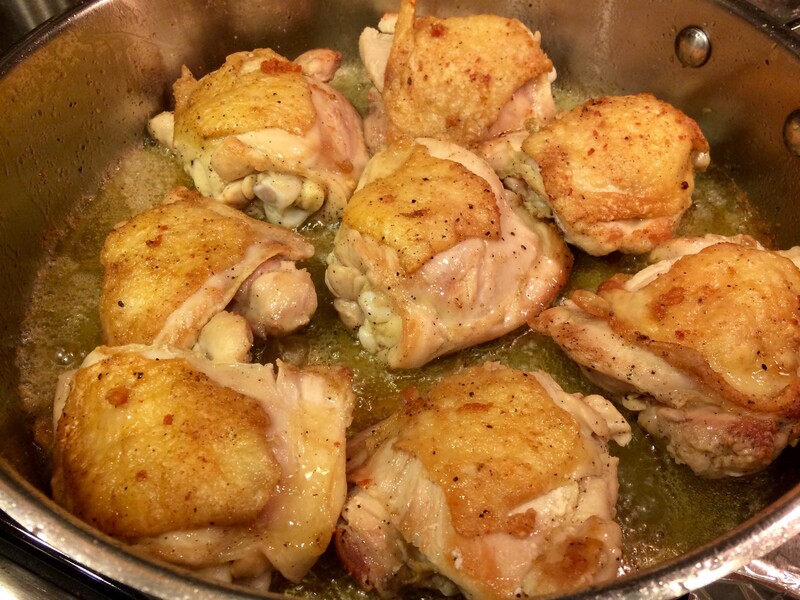 – Add chicken, skin-side down and cook, undisturbed, until chicken is crisped and the fat has begun to render, 8 to 10 minutes. Using tongs, carefully flip chicken skin-side up. Cook until golden brown, 4 to 6 minutes. 4. 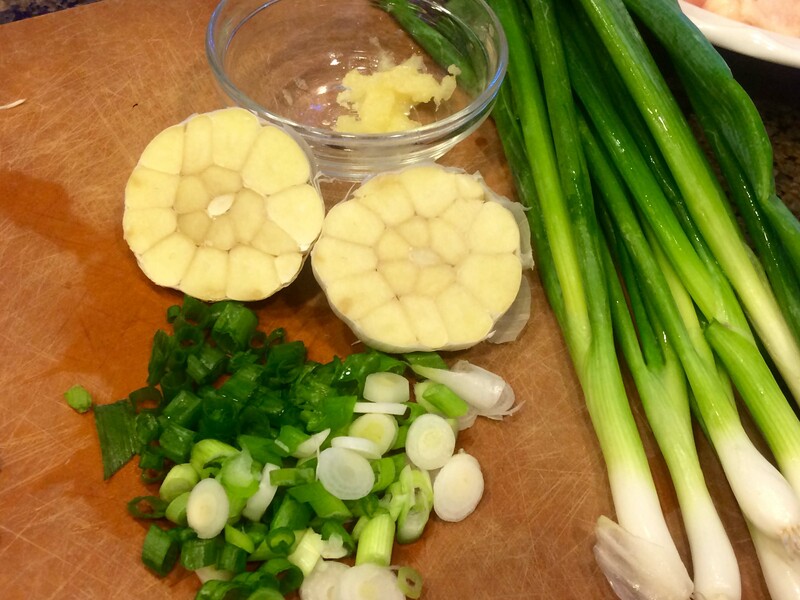 – Meanwhile, thinly slice two scallions; set aside. 5. 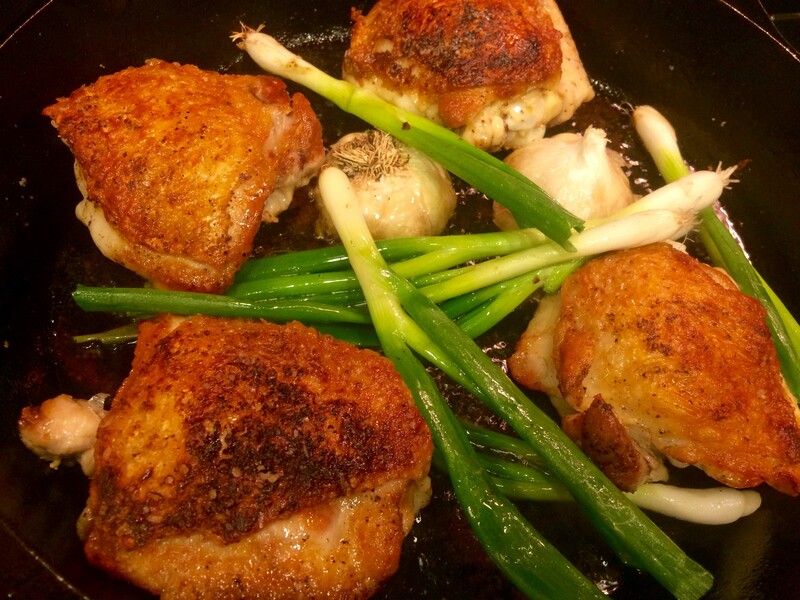 – Add both halves of the head of garlic, cut side down, and remaining whole scallions to the pot and season with salt and pepper, tossing to coat in the chicken fat. 6. 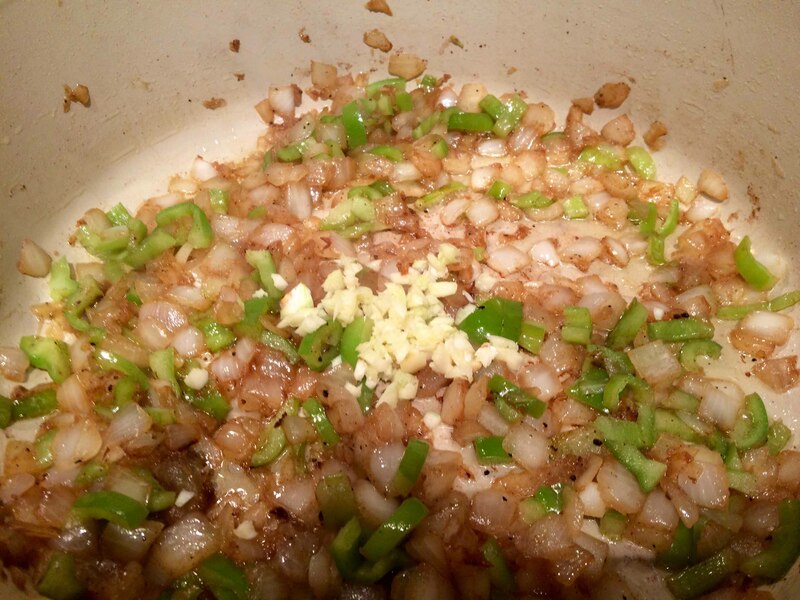 – Cook until scallions are lightly blistered and browned, about 3 minutes. Add grated garlic and stir a minute or two, but do not brown. 7. 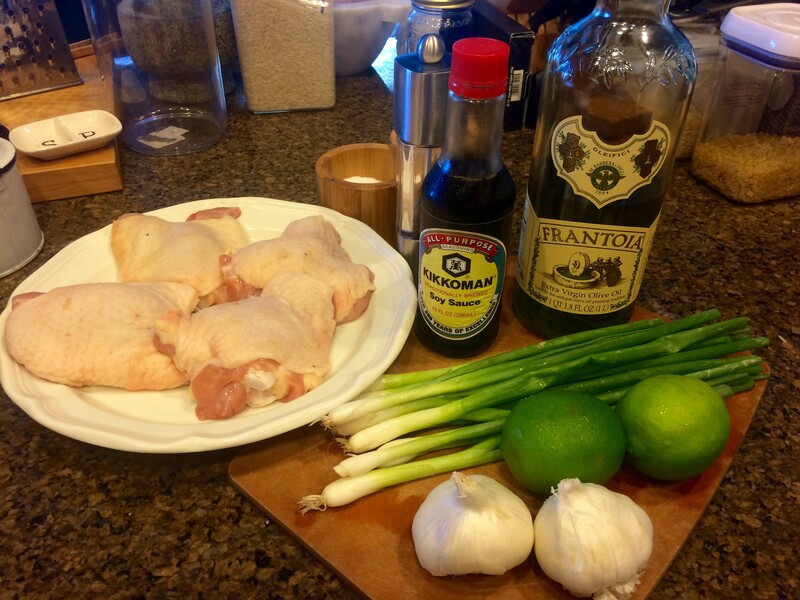 – Scatter sliced scallion over chicken and using a Microplane or zester, zest lime over. Cut lime into quarters and serve alongside. What does it say about your marriage when you opt for celebrating at home over dining out? After four years together, I think it says we don’t need anymore than we already have to be happy and that most of all we treasure our time together alone. Our menu was simple. 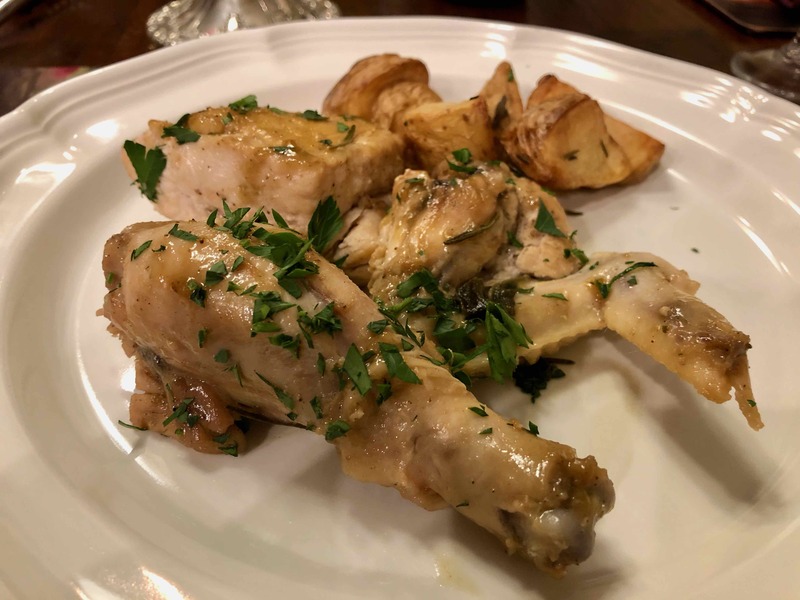 After Champagne with smoked salmon on pumpernickel (OK, maybe a bit of a spurge), we sat down to one of our go-to meals: roast chicken, stuffed with lemon and herbs accompanied by roasted potatoes with rosemary, a mushroom gratin, and roasted cherry tomatoes. As you can see, I opted to add some herbs and lemon wedges. The sides were family classics, all of which went into the oven along with the chicken at different intervals. The potatoes went in at the start and the tomatoes and mushrooms about 15 minutes later. 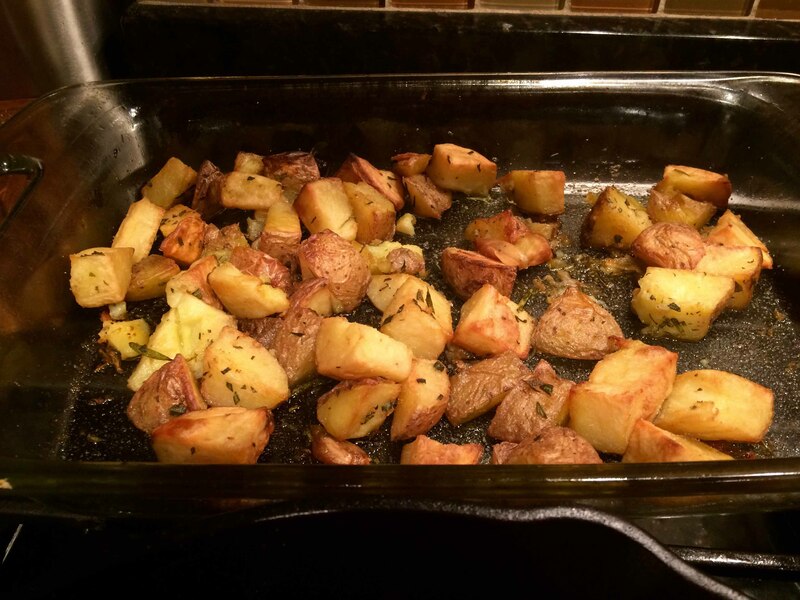 The potatoes are cubed, drizzled with olive oil and sprinkled with salt, pepper, and chopped rosemary. About midway through, turn the potatoes. 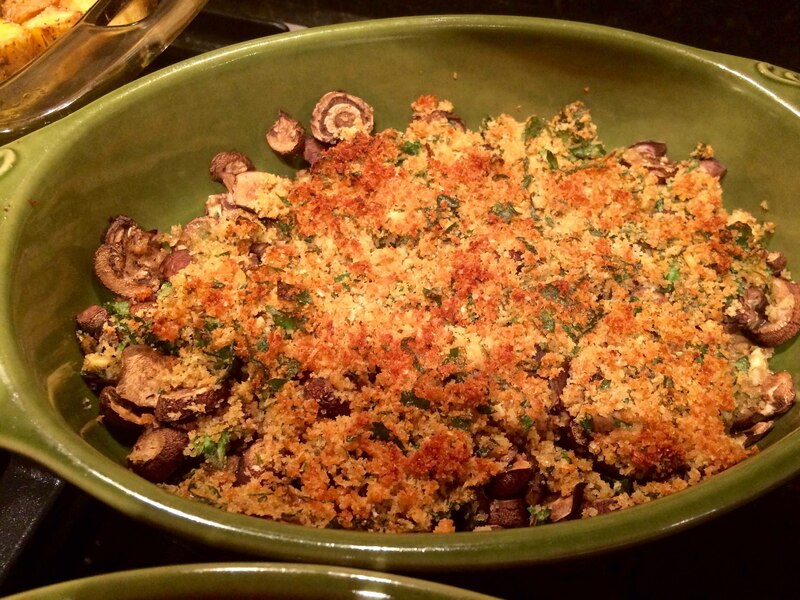 For the mushrooms, I combine dry bread crumbs with minced garlic, finely chopped Italian parsley, grated Romano cheese, sat and pepper and moisten the mixture with some olive oil. I the sprinkle the crumbs over sliced button mushrooms and roast for about 35 minutes. For the tomatoes, I take a pint of grape tomatoes, several cloves of peeled and smashed garlic and a generous pinch of crushed red-pepper flakes and drizzle with olive oil. 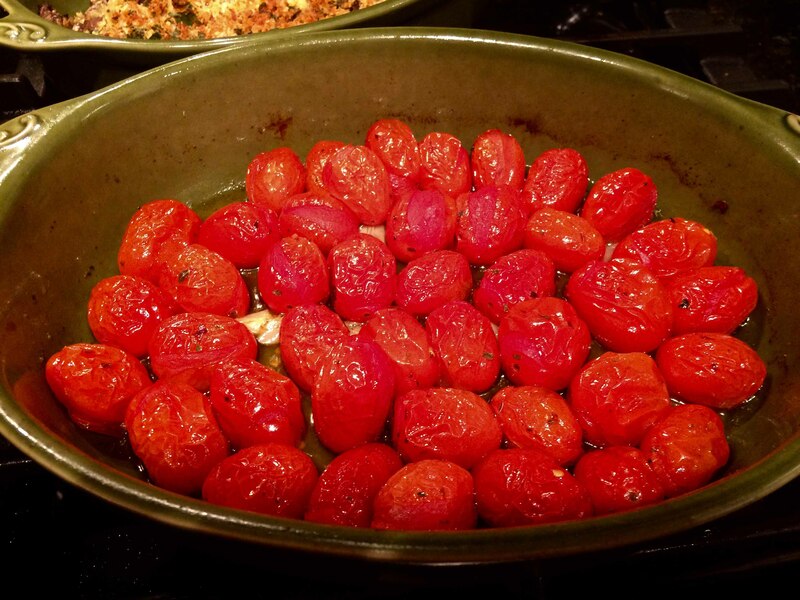 Toss the tomatoes to make sure they’re coated with the oil and roast for about 30 minutes. Our wine choice was a simple Chianti Classico. In my youth, I would have probably gone for a far more elaborate meal to celebrate an anniversary, but now nearing seventy, I’ve begun to take a more relaxed approach to cooking and dining but nonetheless still insist on warmed plates, polished flatware, and most important candle light. 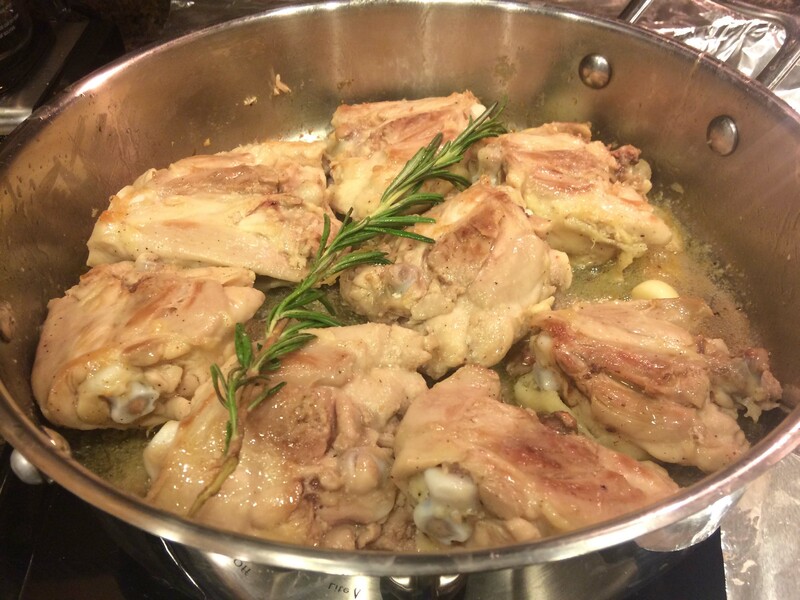 Almost every week I roast bone-in skin-on chicken thighs on a sheet pan the same way, with a mix of fresh thyme and rosemary, lemon zest, salt, pepper, and olive oil. It’s a staple of my comfort-food repertoire. 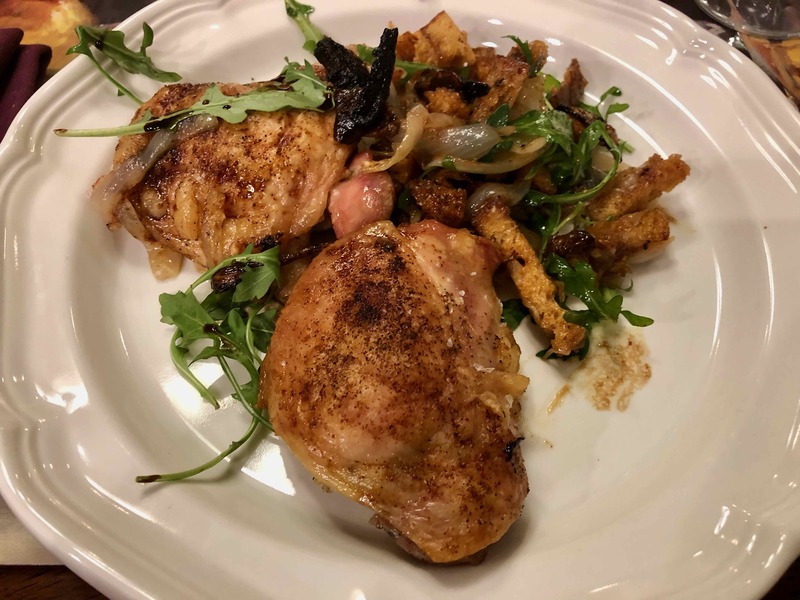 But yesterday, I opted out of my comfort zone and went for a spicier dish: Mark Bittman’s Spicy Roasted Chicken Thighs posted on the New York Times Cooking website. Having all the ingredients for the spice rub in my pantry, except for a small jalapeño, also contributed to my choosing this dish. 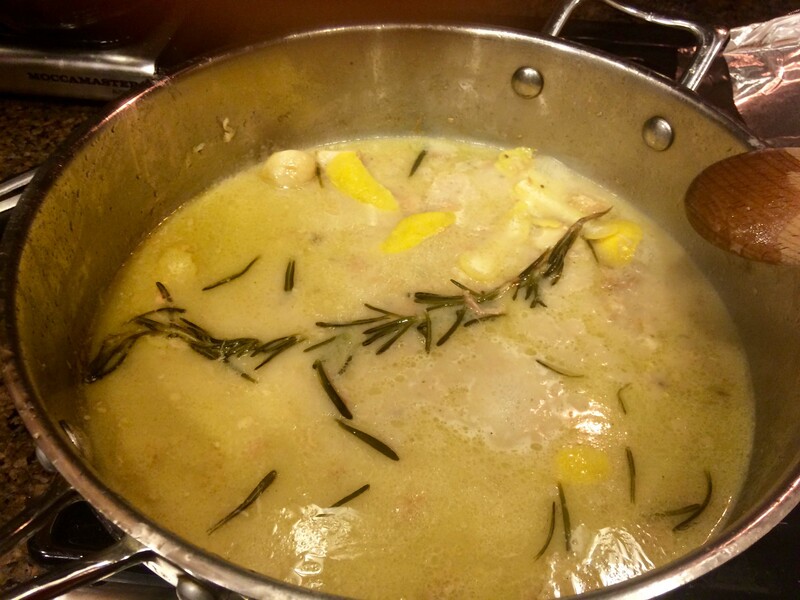 After reading some of the reader comments on the site, I made a few changes to the recipe. 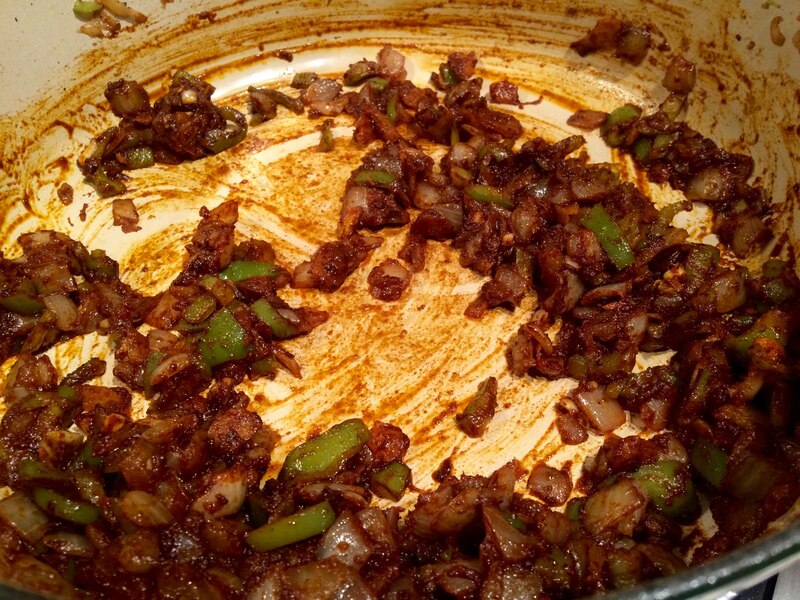 I halved the amount of lemon juice and upped the amount of tomato paste, cumin, and coriander. Unfortunately, I did not increase the amount of salt. I also let the thighs marinate in the fridge for almost 3 hours and then lightly drizzled them with olive oil before putting them into the oven. The result was delicious, but benefited from some additional salt and a drizzle of fresh lemon juice at the table. This is a recipe you can play with (as I plan to do in the future). A camera malfunction (really user error) resulted in my not having any prep photos, but with such an easy recipe I don’t their absence matters. 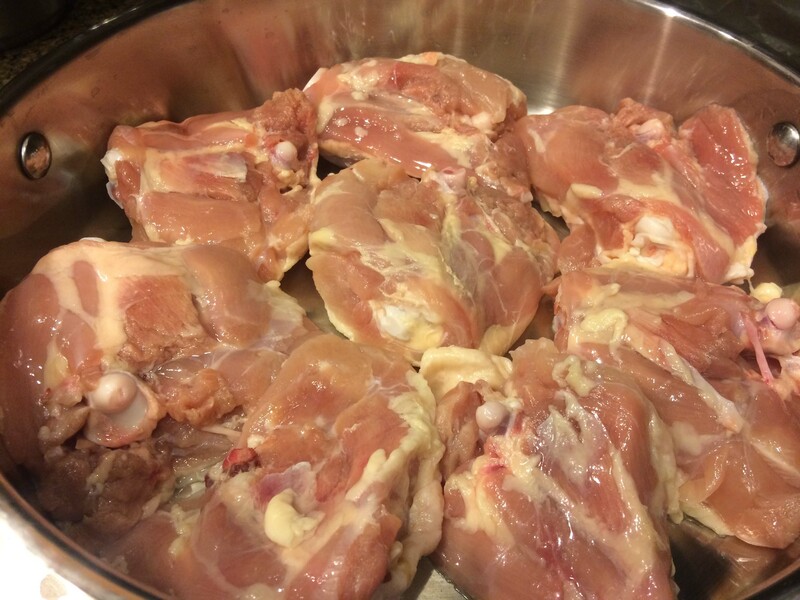 8 chicken thighs, with skin, pierced all over with a small knife and trimmed of any excess skin and fat. 2. 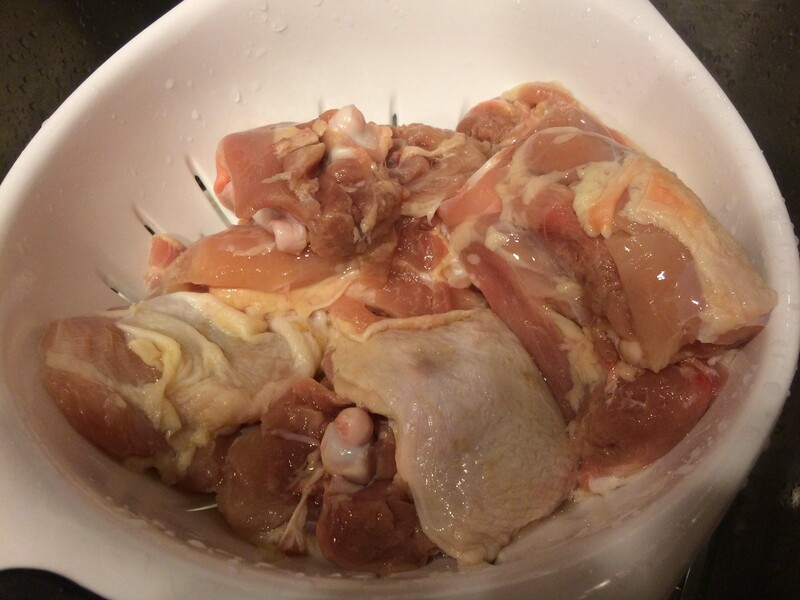 Rub mixture thoroughly into chicken. At this point, you can cover, and refrigerate for up to a day. 3. 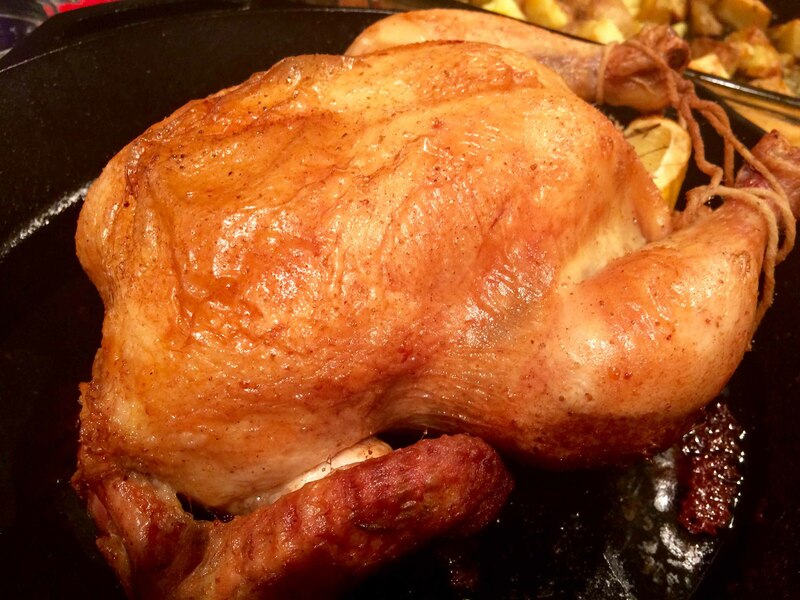 Put thighs, skin side up, in a roasting pan (I prefer a rimmed sheet pan). Roast for 35 to 45 minutes or until done. A few weeks ago, I was reminiscing with some friends about our days as graduate students at Columbia in the early 70s. After talking about friends, teachers, and seminars, it didn’t take us long before we started to recall some of our favorite bars and restaurants near campus: the West End for drinks and burgers, The Symposium for Greek food, V & T’s for Italian and pizza, and The Green Tree for Hungarian. The last of these was perhaps my favorite, for it served large portions at reasonable prices. 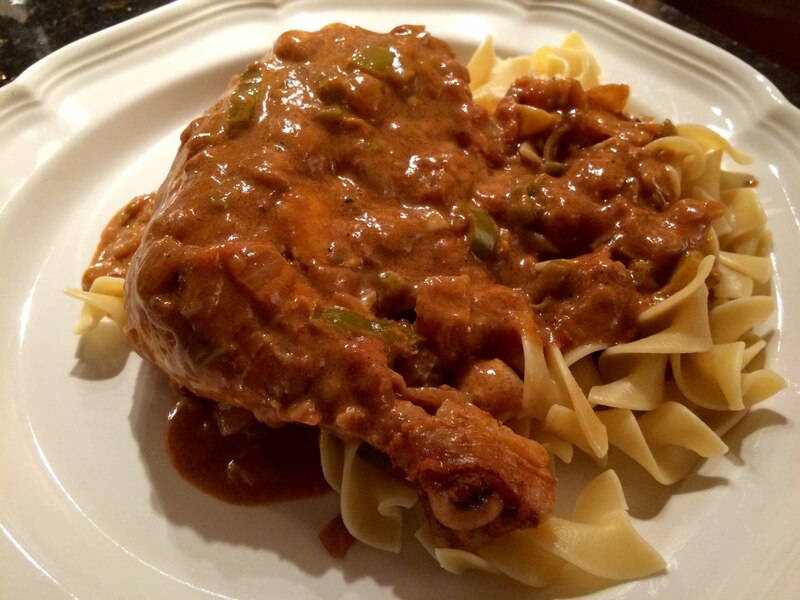 At The Green Tree, I always ordered the same thing: chicken paprikash, which was served with a generous side of small Hungarian dumplings called nokedli. This was pure comfort food, especially during the winter. My most recent attempt at this dish combined several recipes and came close to recreating the dish I enjoyed more than 40 years ago. 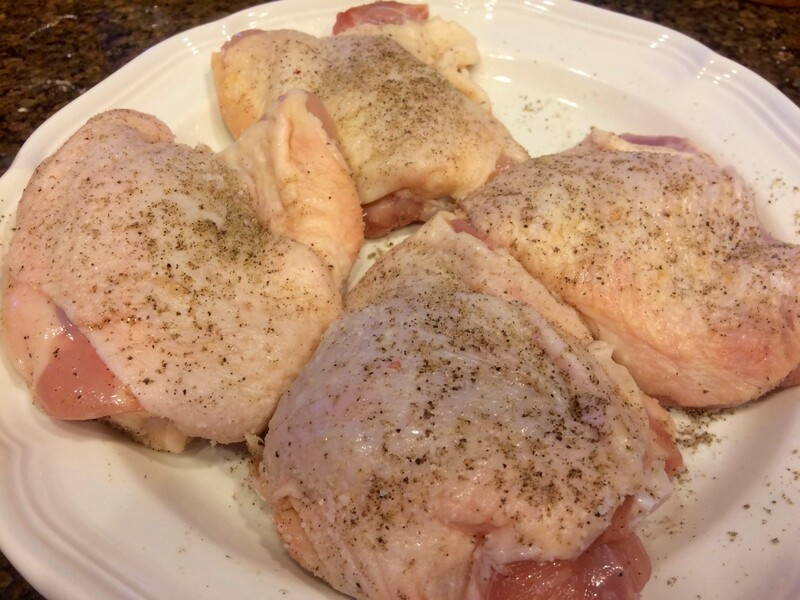 Trim any excess skin and fat from the chicken, pat dry with paper towels, and season with salt and pepper. 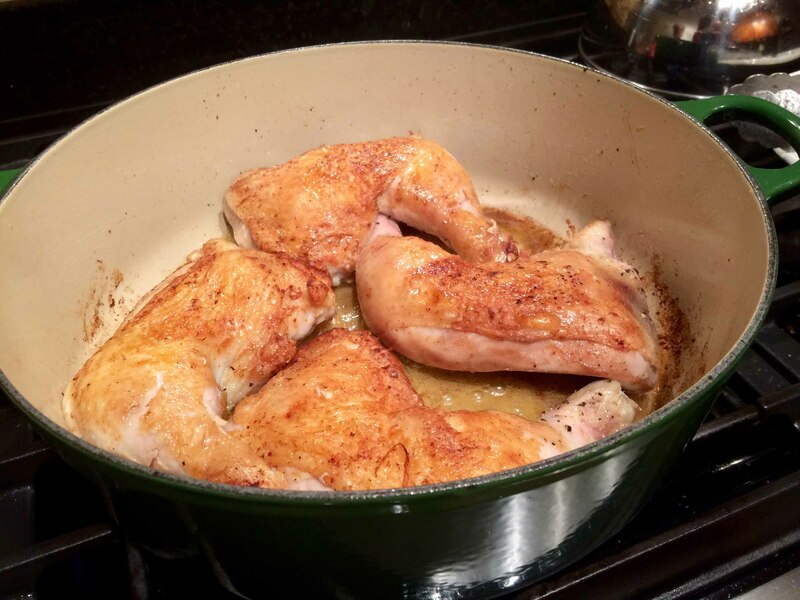 In an enameled cast iron Dutch oven, over medium-high heat, heat the oil and the butter. 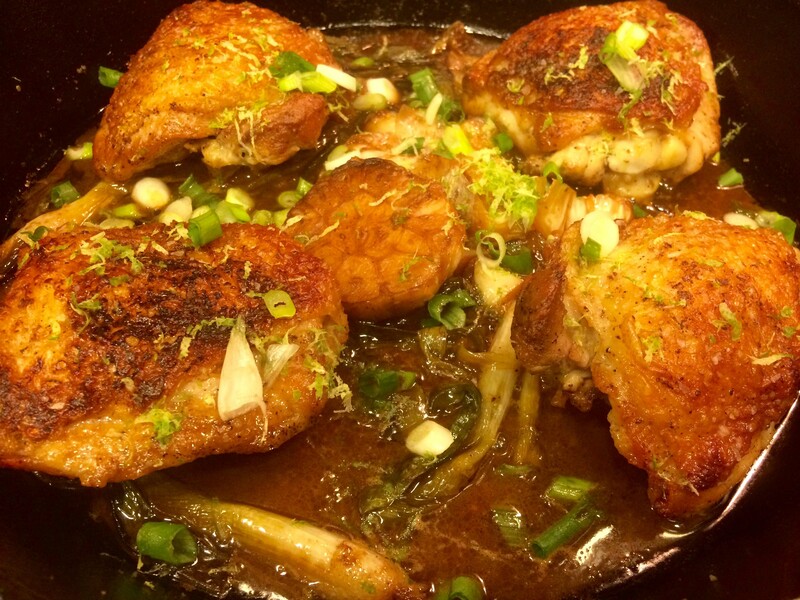 When hot, add the chicken skin-side down and cook each side until nicely browned, about 6 minutes a side. 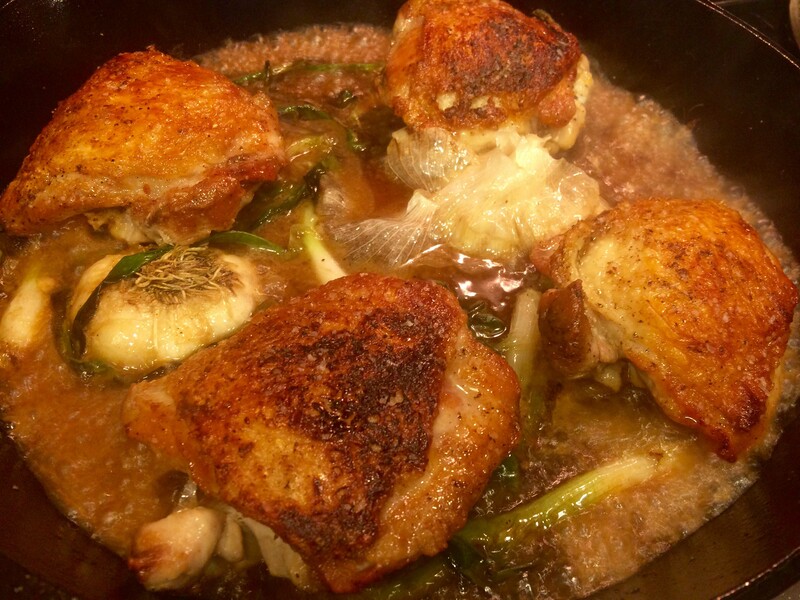 Remove the chicken from the pot and remove some of the excess fat from the pan. Add onions scraping any browned bits from the bottom of the pan, and over medium heat cook the onions covered for 5 to 7 minutes. Make sure that the onions do not brown. 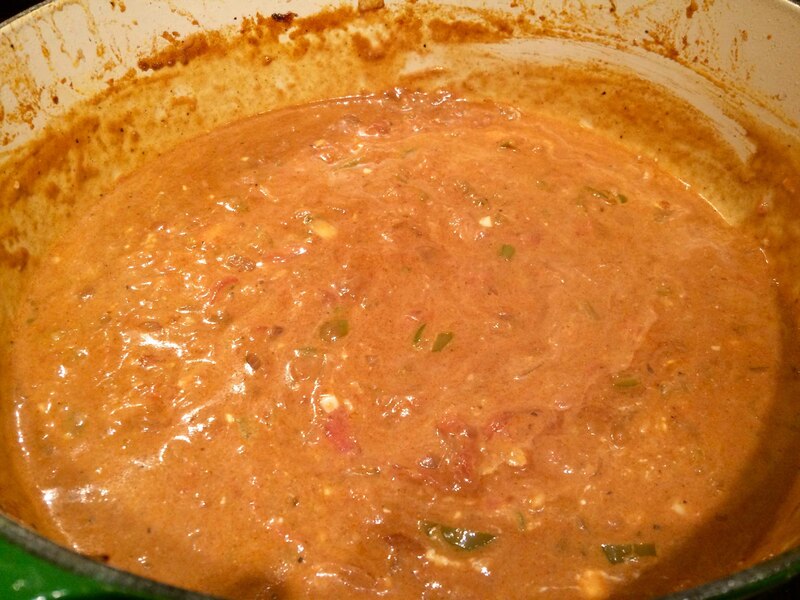 Then add the chopped pepper, cover and cook for an additional 5 minutes, stirring once to avoid browning. Finally add the garlic and cook covered for another 2 minutes, again making sure not to brown the vegetables. Add the paprika and the flour and cook stirring for 1 minute until the spice becomes fragrant. 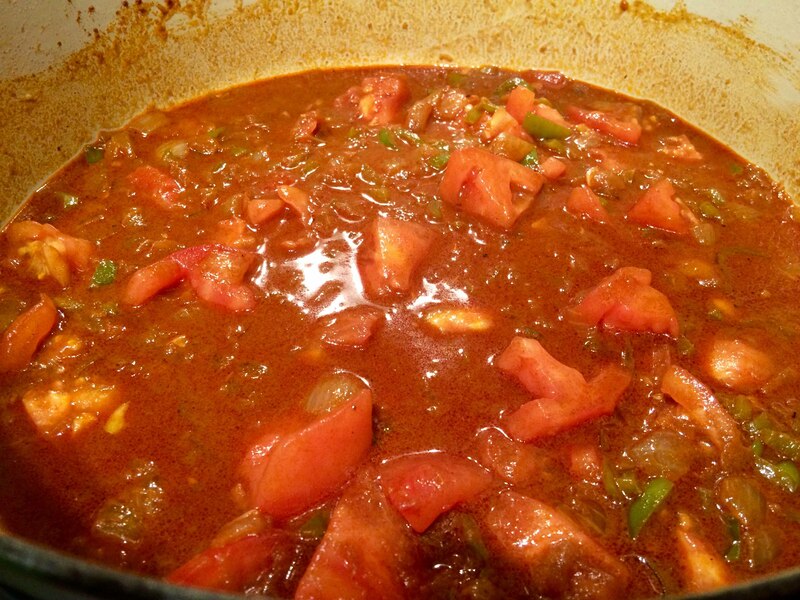 Add the broth, whisking until smooth, and then add the chopped tomato. Bring to a boil over high heat. 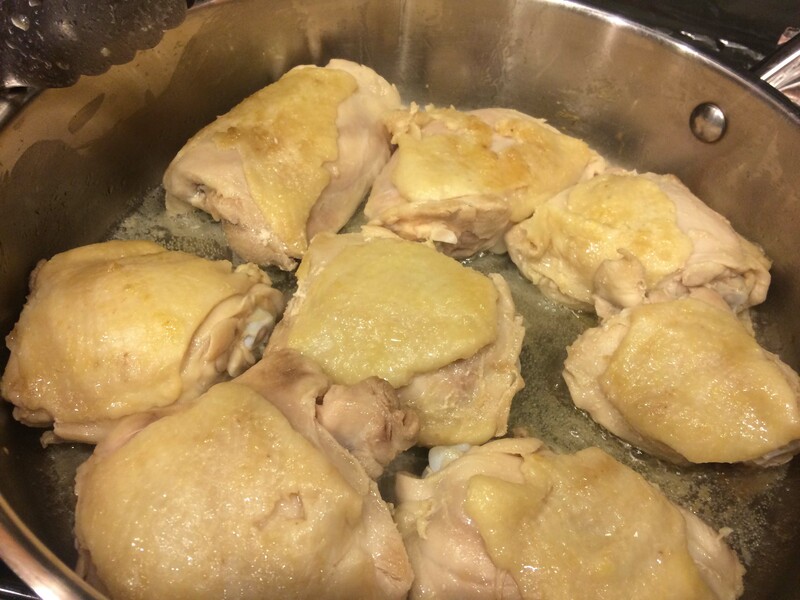 Return the chicken skin side up in a single layer, along with any accumulated juices, to the pot and reduce the heat to medium. 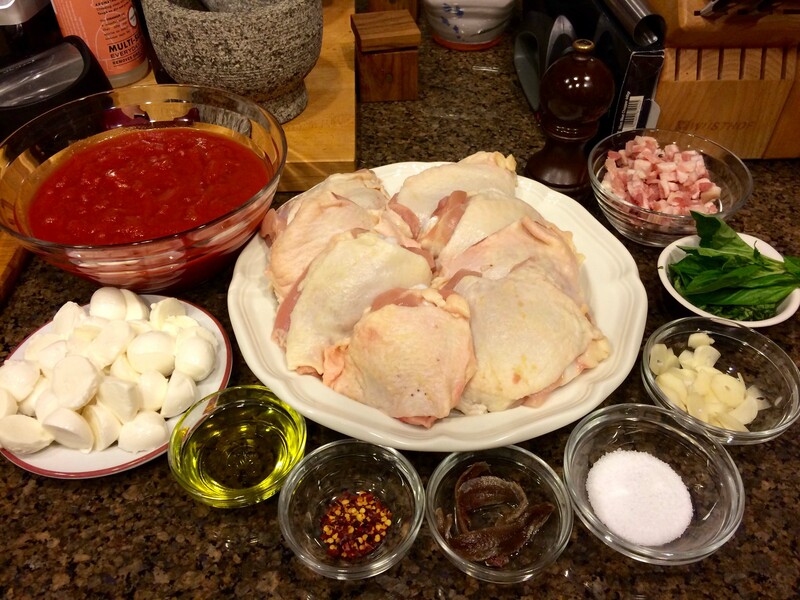 Cover and cook until the chicken is fully cooked, about 20 to 25 minutes. Meanwhile, cook the egg noodles following package directions. 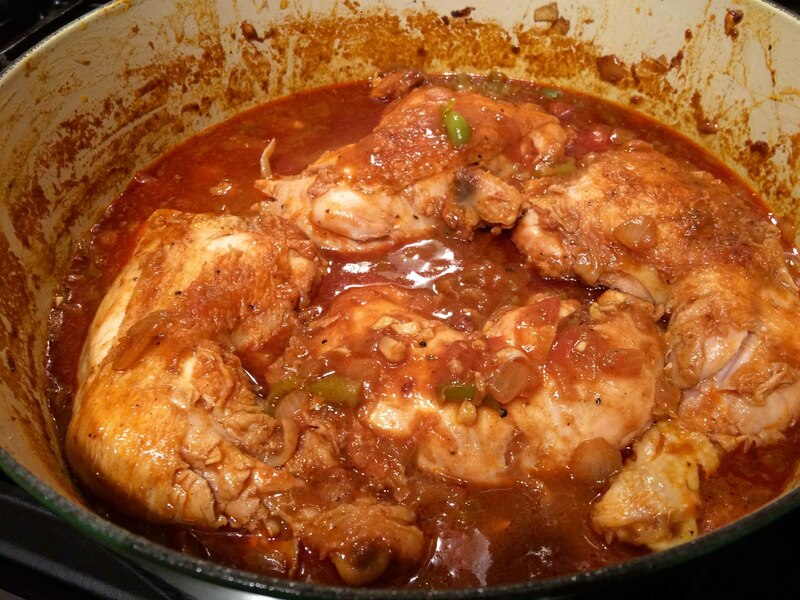 Remove the chicken from the pan and, if necessary, cook the sauce over medium high heat to reduce liquid and thicken the sauce. About 3 minutes. 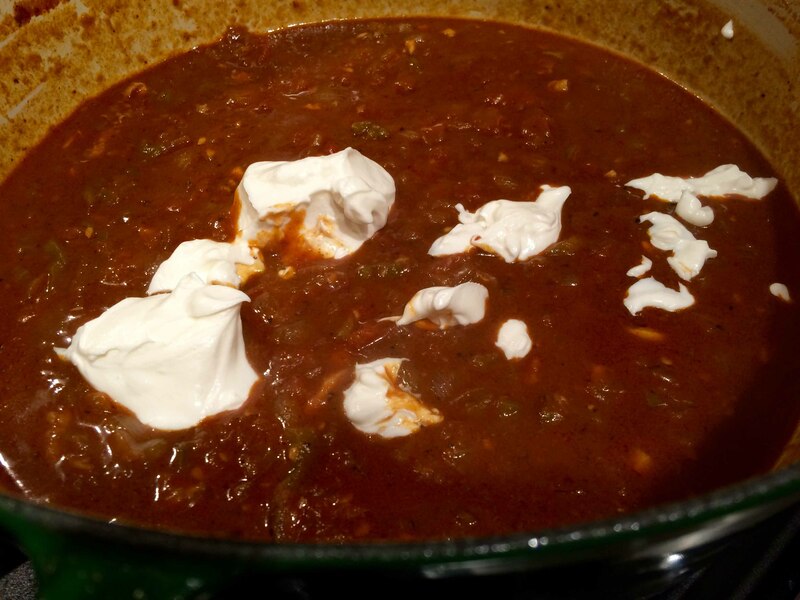 Off the heat, stir the sour cream into the sauce. On plates, arrange the noodles and chicken and generously ladle the sauce over them. 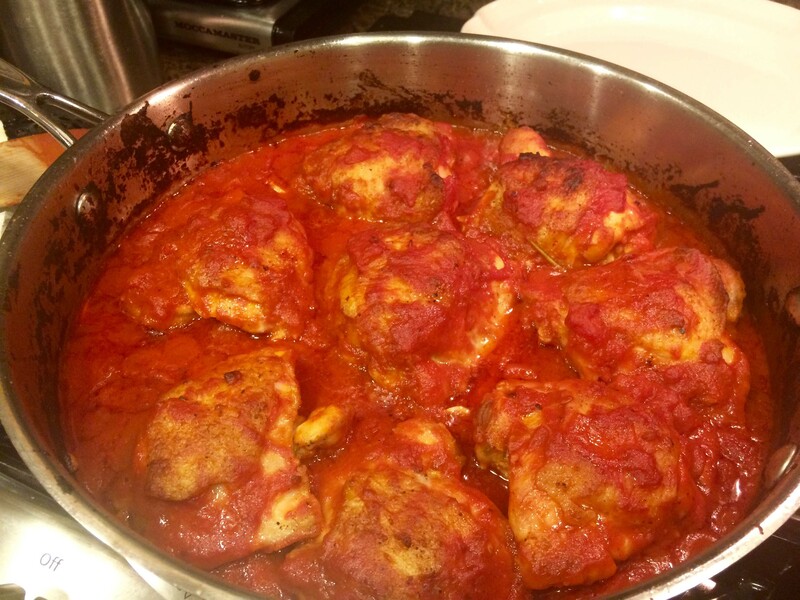 Some of the recipes I consulted were Martha Stewart’s Chicken Paprikash, Rachael Ray’s Hungarian Paprikash, and one from We The Eaters. 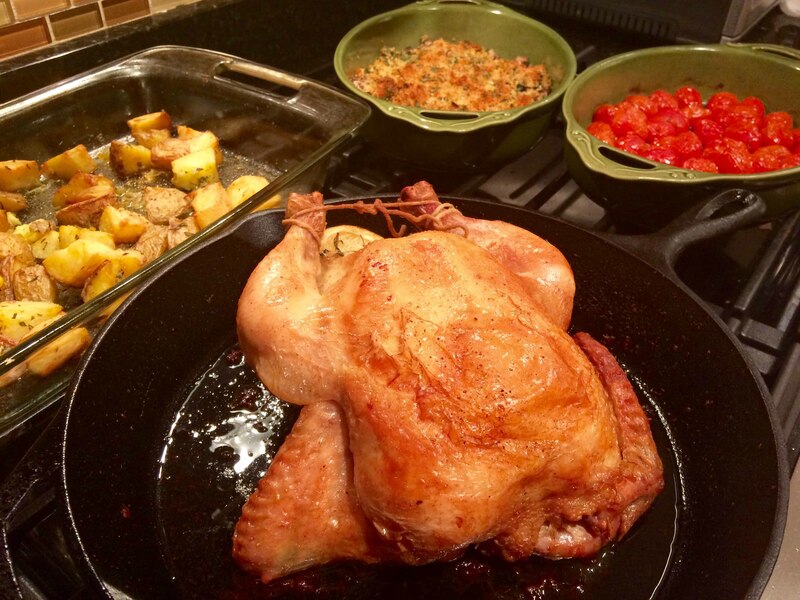 Ray’s use of brined chicken led me to select Kosher chicken for this dish and several Internet recipes, like the one form the We the Eaters website, influenced by use of the cubanelle pepper.